Those aspects alone make this time of year one of my favorites. It’s all sports, all the time. I can’t complain. 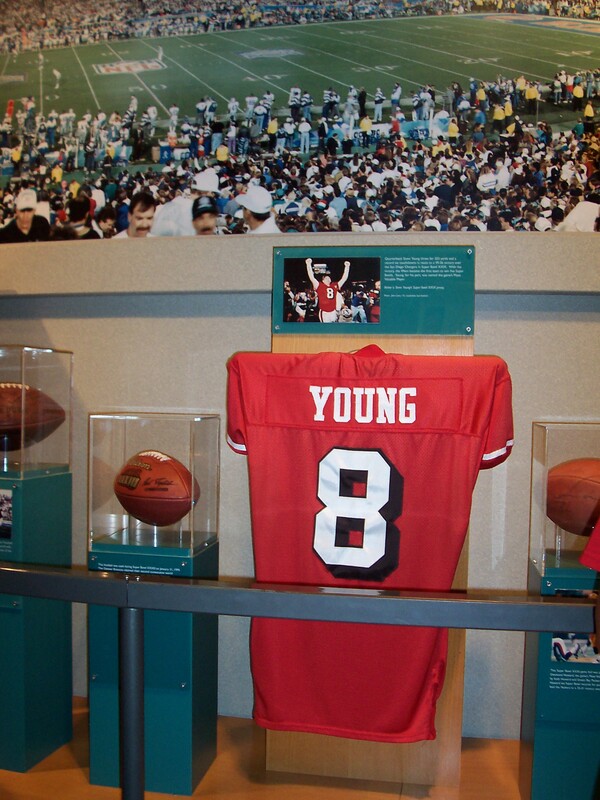 Steve Young's already in Canton, now he'll have his #8 retired by the 49ers. Steve Young is getting his number retired by the San Francisco 49ers on October 5th. – In their game against the Patriots, the 49ers will retire Young’s #8 in a halftime ceremony. Because it’s against the Pats, Bostonian-me might actually get to see a snippet or two of it! Now let’s hope JT O’Sullivan can make like Young and crush the Patriots that day. Jason Bay Gets To Play Baseball in October, Seems Dazed and Confused – I was at Fenway Park when the Red Sox clinched their fifth playoff berth in six years on Tuesday evening. Jason Bay, despite botching a few plays earlier in the evening (which I attribute to him having a newborn at home and for having played like every game this season, be it be for the Sox or Pirates), batted in the winning run for the Sox. During the post-game celebrations, he was seen carrying around a case of Bud Light in a daze on the field. It was amusing – I couldn’t get a great picture of it, but at one point they showed him on the Jumbotron just with this half-awake smile on his face. You gotta love that the number of Bay shirts at Sox games has increased a hundred fold in between the game I went to on September 9 and Tuesday. Also of note is Will Leitch’s great column for WEEI.com last week about Jason Bay – I choked on my coffee reading it, it was so amusing. Choking = I highly recommend it. Everyone’s Favorite Goalie Started His First NHL Game – John Curry, aka “Everyone’s Favorite Goalie” (unless you think Cory Schneider was better…which I don’t), was in goal for the Pittsburgh Penguins on Monday evening’s preseason game against the John Tortorella-less Tampa Bay Lightning (eh, Barry Melrose is full of mullet-y goodness, but as a Rochester girl, I’ll always have a soft spot in my heart for Tortorella.) He stopped all 15 shots he faced, after he entered the game for Dany Sarbourin, in a 3-2 Penguins win. Sarbourin then went on to play a full game on Wednesday against the Leafs, where he let up two late goals, but the Penguins still pulled out a win. Marc-Andre Fleury and Sarbourin haven’t been incredible (one might argue Sarbourin’s never been), and Curry hasn’t been sent down to Wilkes-Barre/Scranton’s camp yet. According to the best AHL blog out there, Penguins’ Insider, the Penguins may bring Curry to Sweeden for their upcoming games there. Listen, Pittsburgh – if you want a boost in merchandise sales, keep Curry in the big leagues, start selling his jersey, and find a way to get about 500 up to Boston. I promise you’ll have no problem selling them out. Umm…the Raiders let the Bills run over them in the second half and couldn’t stop two crucial Bills scoring drives in the fourth quarter. 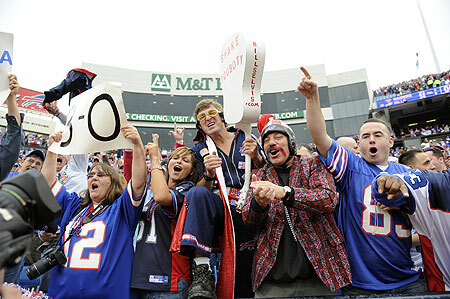 I know the Bills weren’t impressive, but the Raiders were worse. Does Tiki have friends on the Raiders or something? Maybe he was too busy judging on Project Runway to actually watch the game on Sunday afternoon. I’m calling it now – there will be a Broncos – Bills playoff game. And it’ll be awesome. Just you wait.